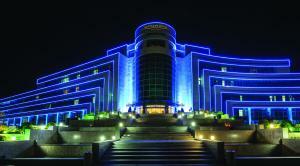 The 4-star Azcot Hotel offers comfort and convenience whether you're on business or holiday in Baku. Featuring a complete list of amenities, guests will find their stay at the property a comfortable one. Service-minded staff will welcome and guide you at the Azcot Hotel. Some of the well-appointed guestrooms feature air conditioning, heating, desk, mini bar, telephone. The hotel offers various recreational opportunities. Convenience and comfort makes Azcot Hotel the perfect choice for your stay in Baku.